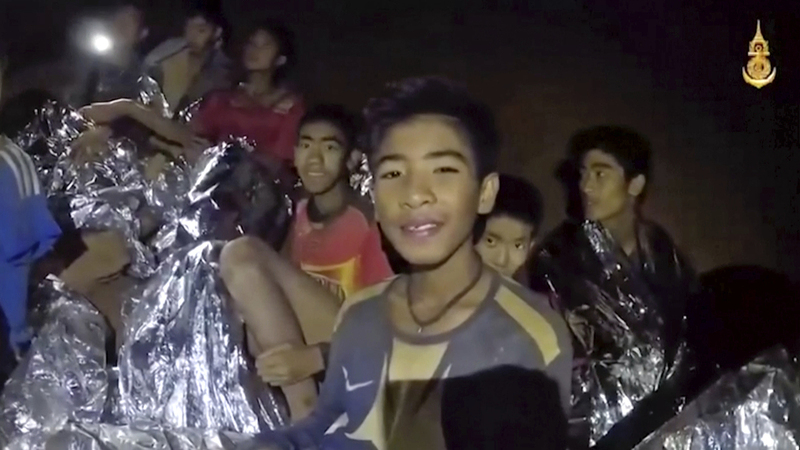 Trapped Thai Boys Appear In Good Spirits In New Video From Cave A new video shows them smiling and saying they're healthy. Now attention is shifting to the extraordinary challenge of getting the team out safely from where they are trapped inside the flooded cave. The team is more than a mile from the entrance to the cave, crowded together and perched on a ledge near a flooded area where the only light shines from their flashlights. A map from the BBC provides a stark picture of their position in the the complicated, water-logged cave. There's a portion that is so steep it requires "full climbing gear," and in another part, the water-filled passage is too narrow for a swimmer to wear a scuba tank. The boys appear to be in good spirits in a new video released on the Facebook page of Thai Navy SEAL. Lit by flashlights, the video shows many of the team members wrapped in silver emergency blankets. They look thin but are being supplied with protein drinks, The Associated Press reported, and appear to have more energy than when they were first found. They're with a Thai military medic and introduce themselves one by one — at one point, bursting into laughter as a group. They say they are healthy. Another video from inside the cave shows a medic treating scratches on one of the boy's feet. The camera pans to the other boys, who flash smiles. 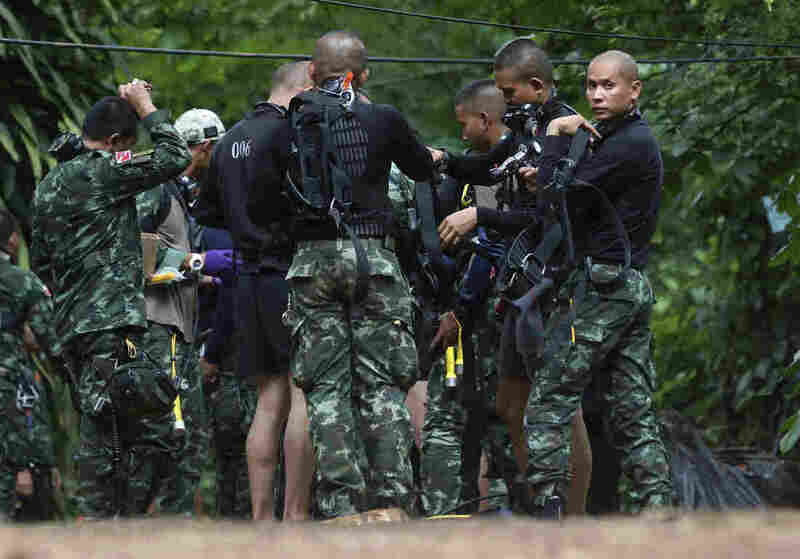 Thai Prime Minister Prayuth Chan-ocha said Wednesday there are only two options right now, the Bangkok Post reports: finding new shafts that could lead out of the cave or having the boys scuba dive out through the flooded cave passageways. And since no alternative route has been found at this point, Thai officials said they are giving the boys a crash course to prepare them for a possible journey. "Now we are teaching the children to swim and dive," Deputy Prime Minister Prawit Wongsuwan said, according to Reuters. Many, if not all, of the boys reportedly do not know how to swim. "The water is very strong and space is narrow. Extracting the children takes a lot of people," the deputy prime minister told reporters. According to The Guardian, Thai authorities are working to procure scuba gear "specially fitted for children." They're also working out how the boys should best be supplied with oxygen during their dives, the newspaper reports — including planning areas that could re-supply oxygen in the winding passages of the cave. There are clearly huge challenges inherent in this plan. "These are really, really small spaces that these [rescuers] had to get to, to get to the kids in the first place. And you have to worry about these kids freaking out a little bit," journalist Michael Sullivan tells Here & Now from Chiang Rai. The water inside the cave also has very low visibility because of sediment. Rescuers have managed to lay diving lines between the boys and the cave entrance, as NPR's Colin Dwyer reported. "Those lines are now helping the boys get essential food and medical supplies — and soon, they may be relied upon to get them out entirely." They're also trying to place a phone line through the cave that would allow the boys to speak to their families, the BBC reported, though they haven't succeeded yet. Rescue efforts could be complicated by the rainy forecast for the rest of the week, which could cause water levels in the cave to rise. Another option that has been discussed is simply keeping the boys in place until conditions improve. But that could mean months of waiting. "Officials are now dismissing the idea of leaving the boys in the cave until the rainy season is over and the water subsides," Sullivan reported on Wednesday. Meanwhile, rescue workers continue to pump water out of the cave. "About 120 million liters of water had been pumped out by late on Tuesday, or about 1.6 million every hour," Reuters reported. That's nearly 32 million gallons. As preparations continue, officials say they are simply waiting for the right moment to move the boys. "If water levels fell and the flow weakened, they would be taken out quickly," Reuters reported, citing the deputy prime minister.